The MGM plugin is not released yet, and stuff will probably still change, but since PellMon is fully free and open source anyone interested can of course have a look and try it out. The source code can be found in this branch. There is no release package yet, but it can be manually installed by following the readme. Yes, and what does this do then... PellMon is free software for monitoring and controlling pellet burners. 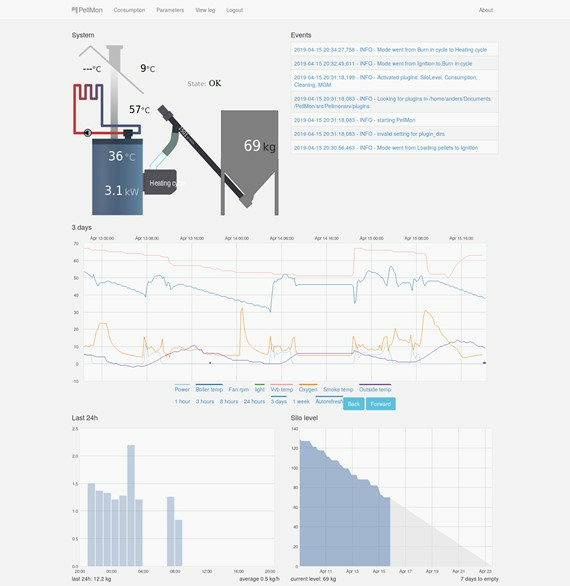 You get logging with graphs, email notifications, custom alarms, automation with custom scripts and remote burner on/off plus a lot more. There is no 'cloud' connection, you run it on your own server. Preferably on something dirt cheap like a raspberry pi. But then you can arrange an internet connection with port forwarding and a dynamic dns provider and then you have a safe internet connection to your burner. And the web interface works great on a mobile screen too.